The origin of spinning jenny (the cotton-spinning machine invented by James Hargreaves) always seemed to me to be named after a person called Jenny. However, as I was reading Etymology for Everyone by Anatoly Lieberman, the author proposed two origins. It "is said to have been so named by the [inventor] after his wife, Jenny." "It is a 'corruption' of gin, a contraction of engine. Gin would easily suggest Jin, Jinny, and Jenny." Does it mean "engine" or is it as innocuous as it appears? An article on revolvy.com stated that "parish registers show that neither [the inventor's] wife nor any of his daughters was called Jenny". Could gin be corrupted this much over time? Any help? Jenny looks very much like a proper name, and the Etymological Compendium: Or, Portfolio of Origins and Inventions says that Jenny was the name Sir Richard Arkwright's wife, not the name of James Hargreaves's wife. Sir Richard Akrwright was a barber who improved the spinning wheel invented by James Hargreaves and made a fortune as a manufacturer. Akrwright's spinning jenny (1783) is said to have been named for his wife, but is perhaps rather a corruption of gin (n.2) "engine." 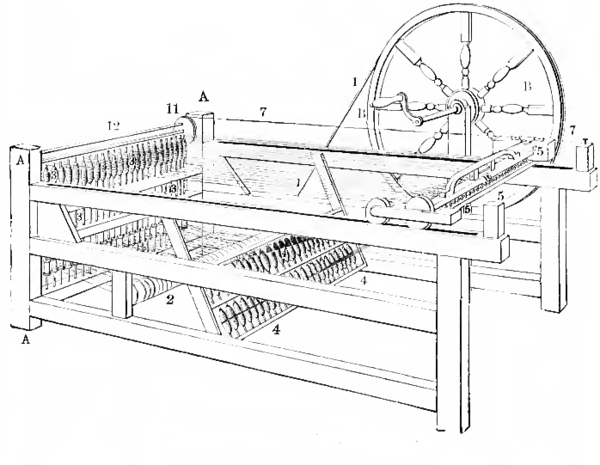 "machine for separating cotton from seeds," 1796, American English, used earlier of other machineries, especially of war or torture, from Middle English gin "ingenious device, contrivance" (c. 1200), from Old French gin "machine, device, scheme," shortened form of engin (see engine). (Uls. 1905 Uls. Jnl. Archaeol. 124, jinny; m. and s.Sc., Uls. 1959). Cf. Jessie. Wullock is a dim. form of Will(iam). --Ayr. 1887 J. Service Dr Duguid 156: Whyles I was so stawed o't, I wished in bitterness of spirit that auld mother Eve had been a Jenny Wullock. A boy doing girl's work had an uneasy row to hoe, having to suffer the mockery of: Hauf a laddie, hauf a lassie, Hauf a jenny-wullock. A cranefly or daddy-long-legs, Tipula oleracea. and which might be poetically attributed to the form of the Fly Wheel. Not the answer you're looking for? Browse other questions tagged origin-unknown or ask your own question. Origins and history for phrase “tote that barge”? What are the origin and history of the forms and meanings of the phrase “top flight”?